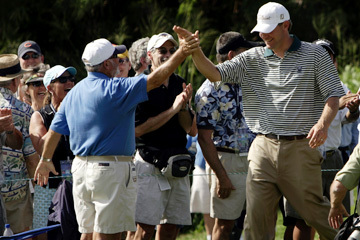 Lucas Glover got a high-five from a spectator after nailing a hole-in-one at the Plantation Course's 203-yard eighth hole during yesterday's third round. KAPALUA, Maui » It wasn't love at first sight for Lucas Glover. His introduction to the Plantation Course on Thursday resulted in four consecutive bogeys to open the round before a birdie at the fifth left him in a better frame of mind. He finished his opening 18 holes at the Mercedes Championships with a 1-over 74 and in a tie for 13th place. That proved to be a lucky number as he moved steadily up the leaderboard into fourth yesterday, just four shots off the pace set by two-time defending champion Stuart Appleby. Glover opened yesterday's third round with another pair of bogeys and appeared to be headed back toward the middle of the pack. But two birdies, a par and then a hole-in-one at the par-3 eighth righted the ship in a hurry for the second-year pro from Greenville, S.C. He qualified for the winners-only tournament by capturing the FUNAI Classic at Walt Disney World. Glover's ace at the 203-yard hole is the first since the Mercedes moved to Kapalua in 1999. The 26-year-old used a 5-iron. The ball landed on the green, bounced twice, hit the pin fairly hard, but still found the bottom of the cup. Glover earned a 2006 Mercedes-Benz CLS55 AMG automobile for his efforts. The four-door coupe, which retails for a cool $87,375, has a 469-horsepower V8 engine. In other words, it can scoot. "I don't know what happened," Glover said of his ace. "I was just trying to get my shot on that top level of the green. That's a tough hole with that wind. It lined up pretty good, then it was just a matter of distance, whether I hit it right or not. 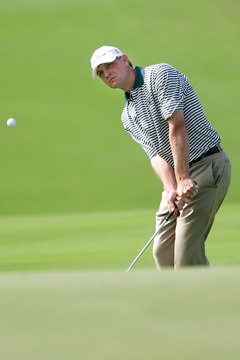 Lucas Glover tied Stuart Appleby for low round yesterday at 3-under 70. "It's potluck on a lot of the holes anyway, especially the par 3s, whether it's going to hold the green or even get there. Two bounces and it went in. I saw the replay for the first time, looked like it probably could have gone in the back bunker, but it didn't. So that was good." Playing partner Mark Calcavecchia was the one who told him the keys for the new Mercedes were waiting for him. "I didn't realize it went in for 10 or 15 seconds," the Clemson graduate said. "Calc and I were up there goofing around. He's like, 'That's a car.' I'm like, 'What?' I didn't realize it and then I thought about it and, 'That's right, it is.' They went crazy up on the green. It was pretty wild." It was the fourth hole-in-one for Glover, but this one was a little extra special. Considering he has bogeyed the first two holes of the tournament three consecutive days, it was good the hole-in-one came along. "I walked off the green there with a pretty big adrenaline rush," Glover said. "I just kept thinking to myself, 'That got you back in the mix. Let's try to go get into contention.' I played nine perfectly. I should have made a birdie there. Should have, would have, could have." Glover remained at 1 under for the tournament for the next six holes, before birdieing the 15th, bogeying the 17th and then finishing with another birdie at the 18th to shoot 70 for the round. The only other golfer to equal that number was Appleby. "It's going to be a tough day for everybody tomorrow," Glover said. "You know, I want to win again. To do that, you've got to get into contention a lot, as I found out last year. I have pretty high goals. "Hopefully, we can get in there and mix it up. Get off to a good start, maybe we can get in there by the turn or something. I think Stuart is comfortable here. It's no surprise. There's guys who play well every tournament, every year. It's just the way things are."